Gelatin Capsule is derived from fish. Ultra-pure fish oil plus organic, non-GMO flax oil join forces for a complete Omega-3 formula. 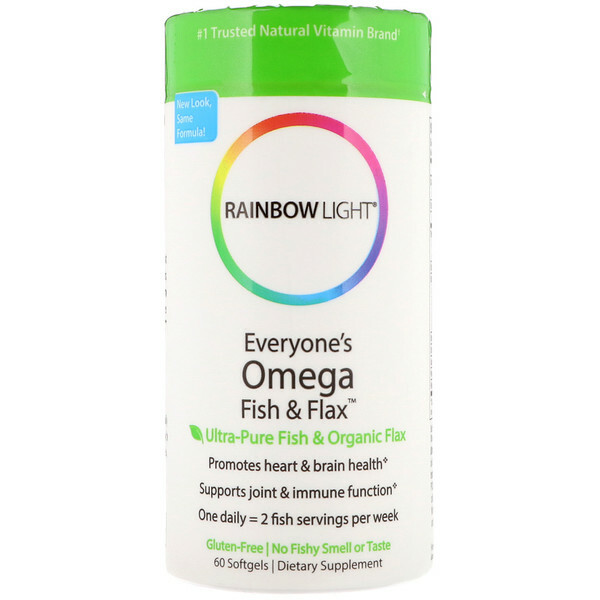 Everyone’s Omega Fish & Flax provides 502 mg of omega-3 fatty acids per softgel – including EPA, DHA and ALA – providing the equivalent of two fish servings per week, as recommended by the American Heart Association. May reduce heart disease risk. Supportive but not conclusive research shows that consumption of EPA and DHA Omega-3 fatty acids may reduce the risk of coronary heart disease. 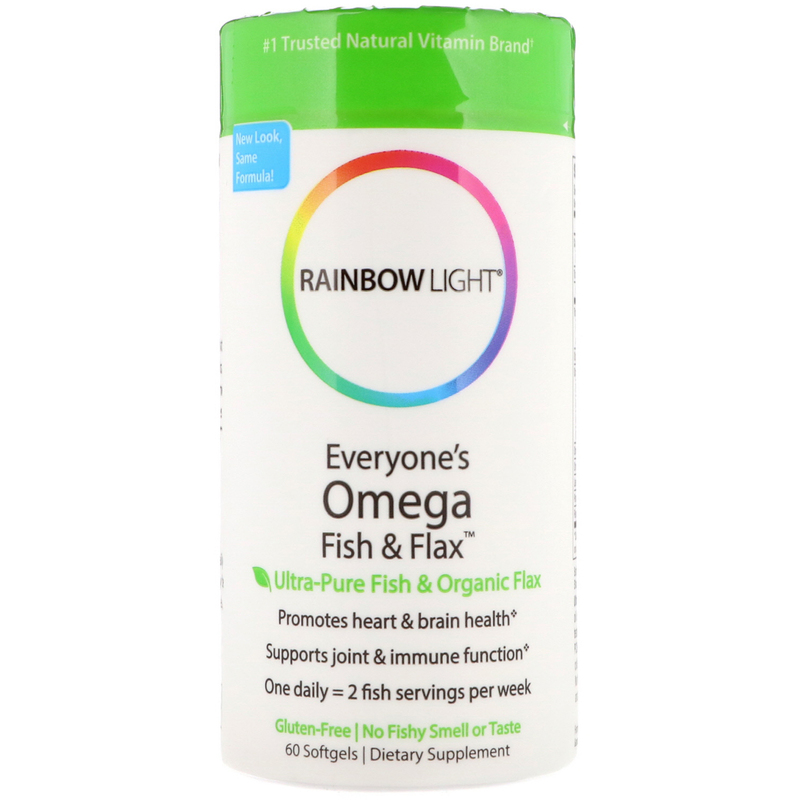 One serving of Everyone’s Omega Fish & Flax provides .375 grams of EPA and DHA omega-3 fatty acids. May support mental health & brain function – Omega-3 fish oil, flax oil, vitamin D3. Promotes immune, joint & bone health – Omega-3 fish oil, flax oil, vitamin D3. Take one softgel daily with or between meals, or as desired. May be taken on an empty stomach. No fishy smell, taste or aftertaste. Softgel shell: 100% fish gelatin (cat fish, nile perch, indian carp, shad, grunt fish, tilapia), purified water, glycerin. Ultra-pure & sustainable: Our molecularly distilled fish oil is sustainably sourced from wild fish, third-party tested, and guaranteed free of solvents, heavy metals, PCBs & other toxins. Our organic flax seed oil is cold-pressed, solvent-free, non-GMO, and grown in North America. 100% FishGel softgels are free of beef and pork. 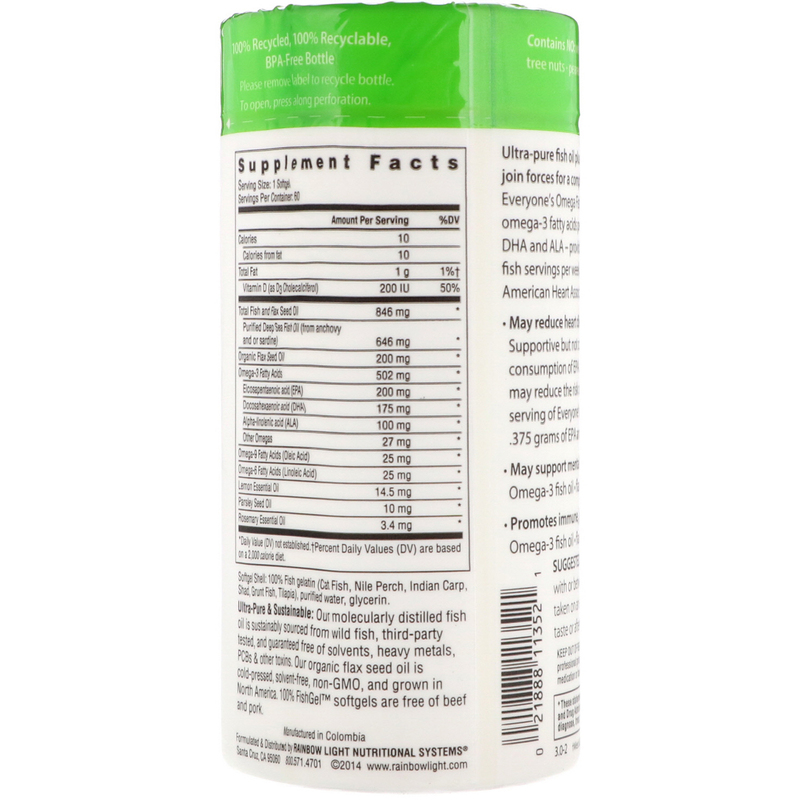 Contains no: wheat, gluten, milk, lactose, tree nuts, peanuts, soy, eggs, shellfish. Keep out of reach of children. Consult your health care professional prior to use if you are pregnant, nursing, taking medication or have a medical condition.